German psychiatrist; born at Bielefeld Dec. 27, 1827; died at Göttingen Feb. 8, 1900. He studied medicine at the universities of Bonn, Würzburg, and Berlin (M.D. 1852), and became assistant at the Charité Hospital in the last-named city. Later he held the post of physician at the insane asylum in Schwetz, and was appointed chief physician at the city hospital, Hamburg, in 1856. In 1866 he became professor of psychiatry at the University of Göttingen, and director of the insane asylum connected with this university, which positions he continued to hold until his death. 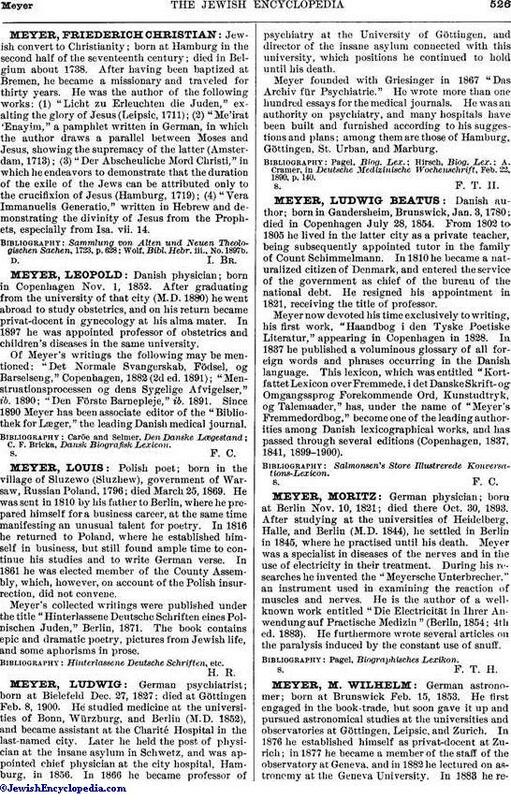 Meyer founded with Griesinger in 1867 "Das Archiv für Psychiatrie." He wrote more than one hundred essays for the medical journals. He was an authority on psychiatry, and many hospitals have been built and furnished according to his suggestions and plans; among them are those of Hamburg, Göttingen, St. Urban, and Marburg. A. Cramer, in Deutsche Medizinische Wochenschrift, Feb. 22. 1890, p. 140.